Step 1 Rehydrate the raisins: In a small saucepan, combine the raisins with the rum, brandy or water, and heat over medium heat until the raisins are softened and plump. Drain the raisins before adding to the apples. Step 2 In a large skillet over medium heat, melt the butter. Stir in the apple slices, brown sugar, cinnamon and salt, and cook, stirring frequently, just until the apple starts to soften, 3 to 4 minutes (the slices should still be crisp). Remove from heat and stir in the raisins and toasted pecans. Spread the apple mixture onto a baking sheet to stop the cooking process and allow the apples to cool quickly, then cover and refrigerate until needed. This makes about 4 cups filling, slightly more than is needed for 12 pies; the extra filling can be eaten right away or used later to flavor pancakes or muffins or as a topping for ice cream. The filling will keep for up to 4 days, covered and refrigerated. Step 3Divide the prepared pie dough into 12 even pieces, about 3 ounces each, and shape each into a small disk. On a lightly floured board, carefully roll each piece into a circle about 6 inches in diameter and about one-eighth -inch thick. The dough will be flaky and will probably crack on the edges; without working the dough too much, gently mold the dough with your hands as it's rolled to form as perfect a circle as possible. Carefully set the circle aside and continue rolling until all of the circles are formed. Step 4Brush the inside of each circle with a very light coating of beaten egg, going all the way to the edge of the circle. Place roughly one-fourth cup of the apple filling in the center of each circle, slightly off to one side (to make it easier to fold over the dough to form the hand pie), but leaving a 1-inch border around the edge on one side. Carefully -- this can be tricky -- fold over half of the dough, lining the edges up to form a half-circle; you may need to support the dough as it's folded over to keep it from cracking. Gently press the edges down to seal the pie. Trim the edges to clean them up, or gently brush the top of the edge of each pie, then fold the edge in for a cleaner-looking edge. Continue until all 12 pies are formed. Step 5Place the prepared pies on 2 parchment-lined baking sheets and refrigerate them, uncovered, for 30 minutes. Meanwhile, heat the oven to 400 degrees. Step 6Remove the chilled pies and brush them with the egg wash. Use a small knife to slash 2 to 3 small steam vents in the top of each pie. Dust each pie with a sprinkling of coarse sugar. Step 7Bake the pies, 1 sheet at a time (refrigerate the other sheet until ready to bake), on the center rack until the pastry is puffed and golden brown, 20 to 25 minutes. Rotate the pies halfway through baking for even coloring. Cool on a rack. The pies can be served warm or at room temperature. In Recipes-list.com we have selected the most viewed recipes from category - Desserts . Enjoy the best recipes specially selected for you! 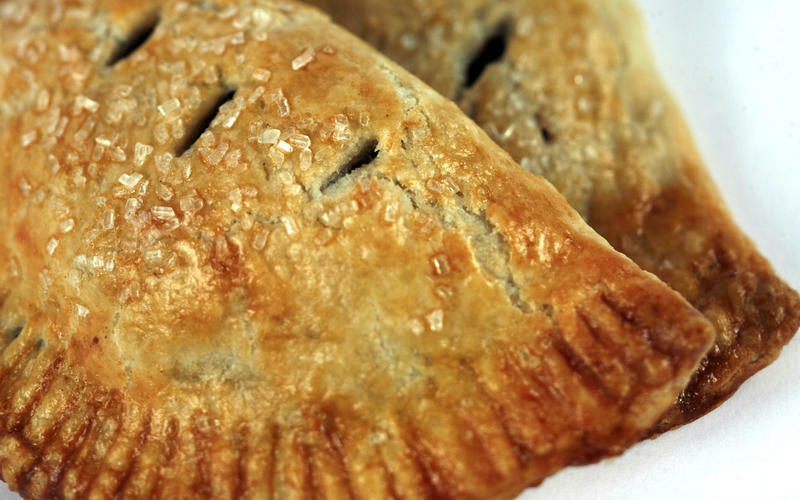 Apple hand pies is the right choice that will satisfy all your claims.